Hiking with Children can be a great way to introduce young ones to the wonders of nature. By planning successful, enjoyable hikes when they're young, you'll set your children on the path to a lifetime of outdoor adventures. Here are some tips for making those first few hikes enjoyable for both kids and adults. Children 2 to 4 years old can hike ½ to 2 miles on their own. They should stop every 10 to 15 minutes to rest. Children ages 5 to 7 can hike for 1 to 3 hours each day, covering 3 to 4 miles over easy terrain. Rest stops should come every 30 to 45 minutes. Eight and 9-year-olds can hike a full day at an easy pace, covering 5 to 6 miles over variable terrain. Set your group's goals based on the youngest child's ability. When loading a hiking pack for a child, limit the pack weight. For backpacking, limit a pack to 20 percent of your child's body weight. Generally, children over 4 will do better with a fanny pack or daypack. Be prepared to carry it out for them. Stay flexible and know when to stop and go home. Be prepared to carry young children out. 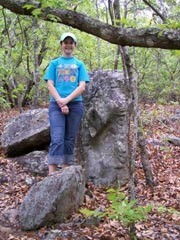 There are several areas on our Pine Mountain Trail to hike with children that are not as difficult as others. The Mountain Creek Trail is relatively flat, and can be hiked in sections from the RV Campground in FDR State Park. The Pool Trail section is a good short out-and-back flatter trail section. Other short out-and-back sections for children are the first mile of the PMT and down a section of the trail west of Dowdell Knob. A good loop for ages 5 or so would be the Dowdell Knob Loop. If children get tired by the time the trail crosses the road, one parent can hike back to Dowdell Knob for the car via the road while Mom stay with children . A hike to one of the falls on the east end of the trail is always a good hike. Your child's favorite wholesome foods/drinks for snacking. Small first aid kit with insect repellent and sting care. Extra Water. It's a good idea to freeze some in a sports water bottle. Do not let children wear open toe shoes/sandals (they will stump their toes on rocks). Tennis shoes that grip worn with socks, or hiking shoes/boots are advised. In colder weather: children get cold faster than adults. The key to comfortable hiking is dress them in several layers, which can be peeled off as they get warm and added as they cool off. Young children should be taught to stay within eyesight as they hike with you and even older children must stay within eyesight and earshot. This is a state park rule for minors. Teach children to stay where they are if they discover they are lost/off the trail. Many children relate to the idea of "hugging a tree" when lost. Instruct them to find a nearby tree and stay with it until they are found. By 4 years, many children can carry a whistle to call for help when lost. The standard distress signal is 3 blows to indicate "I-am-lost," or "I- need- help." 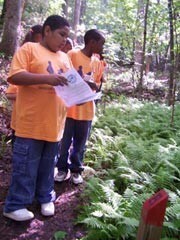 See our survival kit for kids and trail safety pages for more information. Take frequent energy/snack stops. Sing songs. Let them pack their own water. Encourage imaginative games that work into the context of a hike. Take a child's friend along; they'll be more likely to stay entertained. If you have more than one child, appoint one the line leader and rotate periodically. Try bird watching, plant identification, looking for animal tracks, or counting rocks, birds, flowers and other features as you hike. Or try a scavenger hunt. Teach children to stay on the trail at all times. Not only can they get lost, going off the trail can damage fragile plant life and cutting across switch- backs creates a pattern of erosion. For their own safety: no running on the trail. Teach your kids to treat the outdoors kindly. Bring a trash bag and pack out everything you pack in. Teach them to look at certain things with their eyes, and not their hands (i.e., if they see a flower, look at it but not pick it so others can enjoy it.) If they see a frog or lizard, enjoy seeing them, but remember they belong in the park and cannot be taken home. If they find pretty leaf or large pine cone, yes they can take them home.